Sometimes it’s just too hot to turn on the oven. But just ’cause you can’t take the heat, you shouldn’t get out of the kitchen. 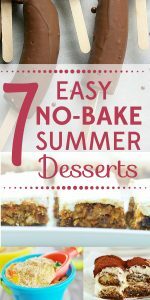 Not with our easy, inexpensive no-bake dessert recipes. Here are 7 easy dessert recipes that won’t leave you hot and bothered. If you’re looking for some fun dessert recipes that go beyond ice cream, look no further! We’ve found some great crowd-pleasing desserts to whet your appetite. 1. Chocolate covered bananas. This classic recipe, from Feeling Foodish, is made with only three ingredients: bananas, chocolate chips, and coconut oil. Together with the kids, you can make a healthy treat for the whole family to enjoy. 2. No-bake tiramisu. Looking for a more adult dessert? How about tiramisu? Kitchen Nostalgia has an easy, no-bake recipe that calls for ladyfingers soaked in coffee, whipped cream and mascarpone cheese. And the best part? It takes only five minutes to prepare! 3. Chocolate lasagna. Yes, please! Center Cut Cook tells you how to make this delicious, decadent dessert. Ingredients include Oreo cookies, butter, cream cheese, Cool Whip, chocolate pudding and mini chocolate chips. Call us when it’s ready! 4. No-bake cheesecake. If that last dessert wasn’t rich enough for you, this one should be. This five-star recipe is billed as a “Five Minute Four Ingredient No Bake Cheesecake.” By Just a Pinch. Only five minutes to make and we don’t even have to turn on the oven? We’re sold! 5. Sand pudding. This clever variation on Worms and Dirt is sure to thrill the kids. Fake Ginger‘s recipe calls for Nilla Wafters, Oreos, cream cheese, butter, powdered sugar, vanilla pudding mix, milk and Cool Whip. 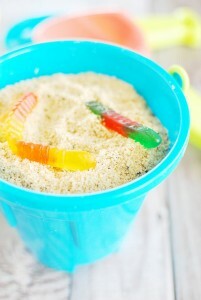 Oh, and don’t forget the gummi worms! 6. Famous chocolate wafer cake. When I was a kid, I remember making this much-loved icebox cake with my mom whenever we had guests over. It was so much fun to put together and amazingly delicious. The recipe is on the side of the box of Nabisco Chocolate Wafers, but you can also find it from Rachael Ray. 7. Healthy no-bake carrot cake bars. Need a break from whipped cream? It’s Happy Healthy Mama to the rescue! This tasty recipe includes ingredients like carrots, walnuts, almonds, dates, oats, raisins, pineapple pieces and spices. Warning: they are addictive! What are your favorite no-bake dessert recipes?